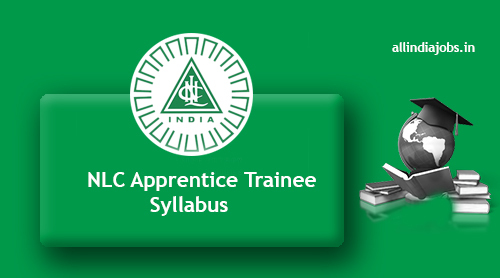 NLC Apprentice Trainee Syllabus 2017 – 2018 | NLC Apprentice Trainee Exam Pattern is available in this article. The Candidates who are going to apply for the NLC Apprentice Trainee Exam posts can now check the Syllabus here. You can check the Syllabus and start preparation. The Exam pattern is given clearly in this article. So the Aspirants who applied for the NLC Apprentice Trainee Exam can Download the Syllabus here and also you can know the exam pattern. There will be so much of competition for any govt exams. So start your preparation and get through the written exam. NLC provides so many facilities to its Employees, so don’t miss this opportunity and start your preparation by following the syllabus that presented in this article. NLC Apprentice Trainee Syllabus 2017 is very useful and helpful for the aspirants in the time of preparation. As the competition is heavy for the jobs we request the candidates to start their preparation as early as possible. Generally, Candidates will be selected for the Position only if they perform well during the Selection process. In this post applicants who are willing to apply can check out NLC Apprentice Trainee Previous Papers and Exam Pattern for Better Preparation. Candidates can also check other Govt Jobs on our site All India Jobs for more updated and fresh Official Information. NLC Recruitment 2017 has been out for a while. NLC Apprentice Trainee has announced a notification to fill up 453 Apprenticeship Trainee Vacancies. Interested candidates can check the complete recruitment process and apply for the openings on or before the last date that is 7th October 2017. So those who are interested in Tamil Nadu Government can refer the entire notification and apply on or before the due date. As many of the job hunters are looking for this recruitment. So the organization will receive the application forms from 28th September 2017. So you have to wait few more days to fill the forms. Aspirants for the NLC Apprentice Trainee examination. Now you can know the previous question papers & test pattern & other important information from our site. You can check the NLC Apprentice Trainee Syllabus 2017 from this article. Before attending the exam applicants can check for the Previous Question Papers, Syllabus and Test Pattern here. Practice these previous papers well to score good marks in your exam. Aspirants can only use them as a reference for their preparation. Firstly, the candidates must know the pattern of the exam so that he can Judge what to read and what not to So for the sake of candidates here we are providing both exam pattern and syllabus. Keep visiting all India jobs for regular syllabus and job updates. The exam pattern is enfolded here. In exam pattern, we have 2 sections. One is Written test and another is Interview. The Test duration is 2 Hrs. So Time management is very important. The important topics are mentioned below for NLC Apprentice Trainee Exam. The examination is an objective type and it contains Questions from different Subjects. We hope the aspirants got enough information to start their preparation for the NLC Apprentice Trainee Syllabus 2017. Keep visiting www.allindiajobs.in to get updated information about NLC Apprentice Trainee Syllabus and Test Pattern.